Actually, the Oslo syndrome applies to all people living in socialist states. The state tells people what to do, forces people into public schools to be indoctrinated, tells people what we can and cannot consume, uses police power, and punishes people who do not do what they are told, and throws people into prisons if they continue to live the way they choose. The state’s system leads most to just accept things as they are as if it were the only possible way of life. Given that the Oslo syndrome applies to an entire nation, and that Norway is living through what will hopefully be the final housing bubble of this cycle, I thought it appropriate to dub the psychological phenomenon associated with housing bubbles, the “Oslo housing bubble syndrome.” This psychological phenomenon is the “irrational” response of people living in a bubble economy. They ignore or dismiss signs of a bubble and instead attribute their good luck (i.e. higher home prices) to “fundamental factors” that appear to substantiate high prices in real estate or stocks. Do not get me wrong. The business cycle is not a psychological phenomenon. However, it does impact mass psychology. If a central bank is intent on expanding the money supply with an easy money policy, then some bankers are going to make additional loans and seek out new clients to lend money to. The bankers will be rewarded and their clients will be happy. As the boom plays out, people make big gains and are euphoric and even manic. The boom eventually turns to bust. Many of the same people who were making big gains are now seeing their profits turn into losses, or even foreclosures or bankruptcies. As a result, they become depressed. The reason that booms turn into busts is that the artificial expansion of credit leads entrepreneurs to embark on many new investment projects that expand the structure of production. The new investment projects eventually cause new constraints to develop. These new developments could not be anticipated by entrepreneurs as a whole. First, all of these new investment projects place strains on the availability of resources and inputs. Therefore their costs are greater than they anticipated. For example, the price of oil and the wages of specialized labor increase as the bubble proceeds to the peak. Second, as the prices of things like food, energy, and other products with inelastic demand rises, customers have less income available to buy their products. Third, as more of these new investment projects come online and start supplying their products, they are faced with increased competition, again more than they could have anticipated. The result is that their investment projects are now faced with higher costs, fewer customers, and more competitors. This is a recipe for disaster that results in the realization of a cluster of entrepreneurial errors. There appear to be housing bubbles across Europe with the exception of the PIIIGS (Portugal, Iceland, Ireland, Italy, Greece, and Spain), but the Norwegian bubble seems to be the strongest one. 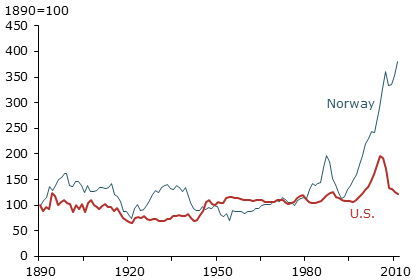 The chart below shows that housing prices in Norway have increased by nearly 300% in the last twenty years. It should be clear from the following chart that the rise in home prices is not the result of rising costs of production or general price inflation, both of which have been relatively tame given the increase in construction and the general expansion in the Norwegian economy. What explains the large increase in prices is an increase in the demand for housing. Part of this increased demand takes the form of people simply being unwilling to put homes on the market in the face of persistently rising home prices. The increase in housing prices has been sustained for a very long time and this would seem to support the idea that the price increases are based on fundamental factors. In the US, housing prices rose much less and for a shorter period of time. 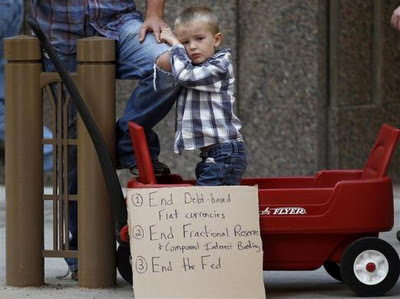 According to an analysis by the Federal Reserve, prices have fallen about 40% in the US since peaking in 2006. Since that time housing prices in Norway have increased another 30%. Sources: Shiller (2005) and Eitrheim and Erlandsen (2004, 2005). The US has many fundamental flaws in its economy including a large government budget deficit, a large trade deficit, expanding national debt, and exploding, unfunded financial liabilities related to health care and retirees. In contrast, Norway has none of these problems and several factors that suggest that the Norwegian economy is fundamentally sound. It has a large trade surplus and government budget surplus (both have been averaging around 14% of GDP) due to substantial oil revenues that are also building a very large sovereign wealth fund. The fund is approaching $700 billion dollars (Norway’s population is approximately 5 million). The unemployment rate in Norway has been averaging around 3% which would be considered well below the “natural unemployment rate” in the US (thought to be around 6%). Therefore, Norway has one of the best unemployment rates in its region, in Europe, and even globally. The C.P.I. measure of price inflation in Norway has been around 1%, again one of the best in the world. Real G.D.P. growth has been about 3% and is expected to continue on that path into the future. 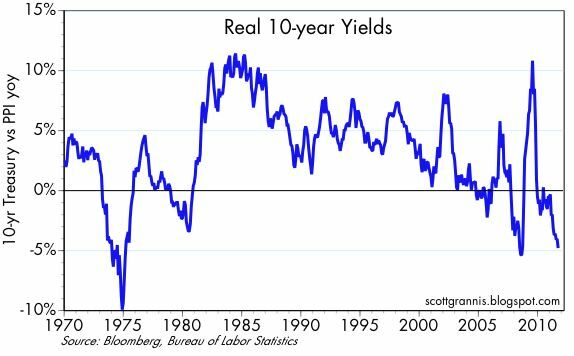 This growth rate would be consistent with full employment. It is almost too good to be true. So the fundamental picture does support the impression that housing prices are real. 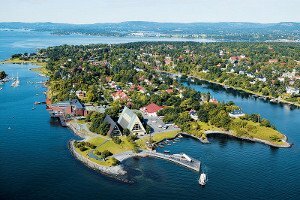 Another factor that supports a “fundamental” view of housing prices is that Oslo, the capital city with almost 1/5th of the nation’s population, has land-use restrictions that keep much land unavailable for construction. This is the same fundamental case that was given for the severe housing bubble in Las Vegas: the government prevented land from being developed. Housing prices in Oslo, however, have not risen much more than the average increase. The largest increases have occurred in areas associated with the oil and oil exploration business. We cannot know for certain that Norway is experiencing a bubble. However the reasons we suspect a bubble starts with their economy. Norway’s rosy economy is not the result of good policy, but of oil revenues that subsidize their socialist government. Norway ranks 40th on the Freedom Index, below Belgium (38) and Armenia (39), and only above countries like El Salvador (41) and Peru (42). A steep drop in oil prices would be a severe blow to their economy. However, as oil revenues are continuing to pour into the government budget and sovereign wealth fund, it makes the Norwegian economy look like a good bet. That image is particularly compelling compared to other economies across the globe. All the world’s major economies (i.e., the US, EU, China, and Japan) appear to be tottering on the verge of disaster. Currencies seem to be particularly dangerous given the Bernanke regime of “coordinated” quantitative easing by central banks. The euro is considered most at risk because of a potential uncoordinated currency break up. This threat has resulted in a decreased demand for the euro and an increased demand for alternative currencies from safe countries, such as the Swiss franc and the Norwegian krone. Instead of allowing the krone to increase in value with this increase in demand, the Norwegian central bank, the Norges Bank, has instead countered with an increase of supply. 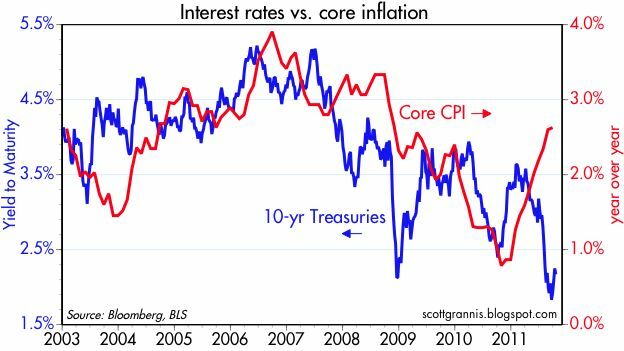 They have intentionally set interest rates artificial low. The overnight deposit rate has been set at 1.5 percent since last December. They are trying to prevent the krone from appreciating in value, but their efforts have not been completely successful. Preventing this appreciation of the krone is intended to protect exporters, including their national oil company. However, it also helps pump up the housing bubble. Monetary inflation, as measured by Norway’s M2 measure of the money supply, has lately been running at 8%. During the economic crisis, circa 2007, it ran as high as 20%. From 2008 to the present monetary inflation has averaged about 7.5%. The result is that Norway is experiencing low price inflation, except in housing and there is still upward pressure on the value of the krone. With central banks around the globe setting interest rates outrageously low it makes it difficult for the Norges Bank to act to raise rates. Higher interest rates would help deflate the housing bubble, but they have failed to implement such a policy. With central bankers embarking on an inflationary death march, the Norges Bank has found itself seemingly trapped into following their policy of ultra low interest rates and monetary inflation. This is incongruous given that the Norway chose to keep its monetary independence and stay out of the euro zone. It is also unnecessary because the Norges Bank has a policy option. As usual, with policy decisions it is a matter of making a people wealthier or making a people poorer. In the case of the Oslo housing bubble syndrome, it looks like poorer will win out again.